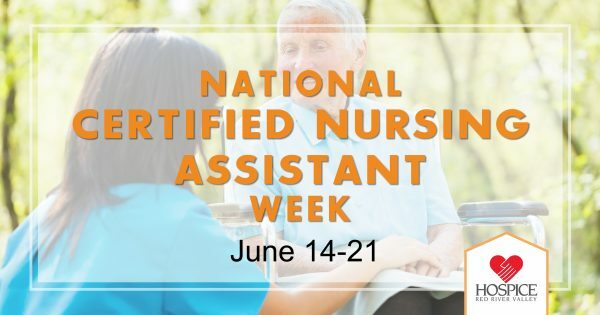 June 14-21 is National Nursing Assistants Week, a time to celebrate the professional contributions of certified nursing assistants (CNAs) in providing high-quality care to patients. Some of our patients call them angels on Earth, others refer to them as superheroes. We call them certified nursing assistants (CNAs) at Hospice of the Red River Valley. Without a cape or wings, hospice CNAs harness their professional competencies and caring hearts to help our patients feel like themselves—a priceless gift as one continues to live fully while nearing the end of life. Hospice of the Red River Valley CNAs work with patients to provide individualized care based on each person’s preferences. A CNA is an integral part of a hospice patient’s care team, which also includes a registered nurse, chaplain, social worker, nurse practitioner and physician. With approximately 40 CNAs spread across the agency’s 29-county service area, Hospice of the Red River Valley CNAs often spend the most time with patients while providing the most delicate of cares. Providing care for someone who nears the end of life is sacred work, a calling that often aligns with their personal values and speaks to the core of who they are as people—empathetic, compassionate and kind. Hospice of the Red River Valley CNAs Mike Carbno and Amanda Hanson provide care to Hospice patients in and around Valley City, Lisbon, Oakes, Lidgerwood, Dickey, Jamestown, Litchville and many other communities west of the Red River Valley; they often travel upwards to 1,000 miles per week. “A long time ago I dedicated my life to love and compassion,” shared Mike, who has worked as a CNA for eight years. “Working as a CNA isn’t a job for me, it’s just an extension of who I am. I’m a caregiver with a hospice heart.” Amanda agrees and shared that if this were just a job, they wouldn’t last long. Cyndy Andren, a resident of Valley City, N.D., and Hospice of the Red River Valley patient, can attest to the trustworthy care of her CNAs. She relies on Mike and Amanda. For Cyndy, who lives with COPD, a progressive lung disease, daily life had become challenging as her condition progressed. Mike and Amanda, along with the rest of the Hospice of the Red River Valley care team, make her life better and easier. “They’re so good about knowing what I need, and we share wonderful conversation,” Cyndy said. “It doesn’t matter if Mike or Amanda has cared for me, after they’re done I feel so relaxed and like a weight has been taken off. They take such good care of me. Mike and Amanda are tremendous. I just don’t have enough time to tell you what they mean to me,” Cyndy shared. “We become close with our patients and their families, and that makes our job both easier and harder at the same time because we know their health will eventually fail,” Mike said. “I get attached to my patients, but this helps me do a good job. It’s an honor to be there with them. Collectively, Hospice CNAs believe this work helps people fully live, not just exist, until they die. “I wish people took advantage of it [hospice care] sooner,” Diego said. “There is so much we can do to support the patient and their family. We are here to provide support to your loved one and to you as their family. During National Nursing Assistant week, and every day, we extend our admiration and thanks to CNAs for the important work they do in our communities.